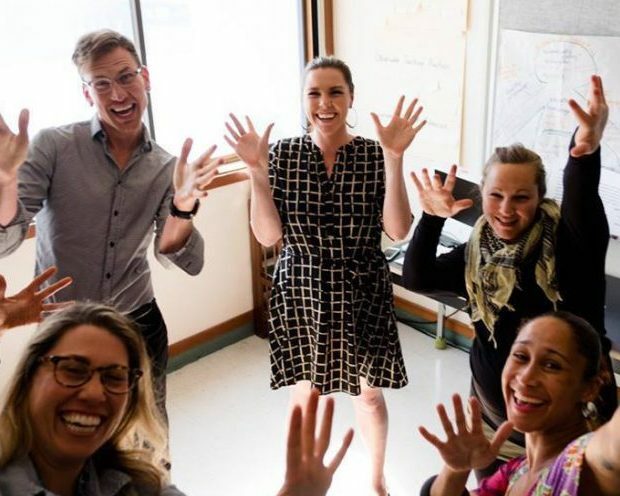 Editor’s Note: In celebration of Teacher Appreciation Month, guest blogger, Kelly Knoche, a former Oakland Unified School District teacher and owner of The Teaching Well, provides tips on ways teachers can take care of themselves outside of the classroom. As an educator for 6 years in middle schools throughout Oakland, I know the joy of being a public school teacher: The constant barrage of hugs that come every day, watching students learn how to time jokes, seeing them grow as learners and thinkers. However, I did leave. During my early years as a teacher I set a pace for myself that I could no longer keep up with. I forgot, over time, that my health and wellness mattered. I spent hours, day in and out, doing what was “best” for kids and slowly it began to erode my personal balance. After my third year, I was 30 pounds heavier, exhausted, and, most importantly, feeling like leaving teaching was necessary, irrelevant of the impact on my students and school. My story is not unique. In Oakland, 70% of all teachers leave the classroom within 5 years (2012 study) and nationally it is not much better (45%). Teachers juggle the roles of educator, therapist, and social worker and often take home the trauma our students experience. Each year, we are asked to do more whether or not funding comes in. The urgency is REAL. There are so many reasons to speed up and keep upping the pace, but let me lay out a few reasons why your focus on self-care (and slowing down sometimes) will make a difference. Continuity of care is critical and that only can happen if educator self-care is prioritized from day one. Equity for all students means long term change. Long term change means teachers need to be able to stay in the classroom. Self-Care for teachers is not about us. It is about being the most effective caregivers and educators we can possibly be. It is about celebrating the wins of our students and watching the whole family come through your school. It is about your joy working for youth buoying your efforts in spite of the low salary or challenges that many of our districts and schools face. It is about building resilience to stay on the front line and make a difference. That’s why when I left the classroom I continued my quest for practices that could allow a teacher to stay in their “sweet spot”: that happy, sustainable place where teachers feel taken care of and are able to be their best for students. 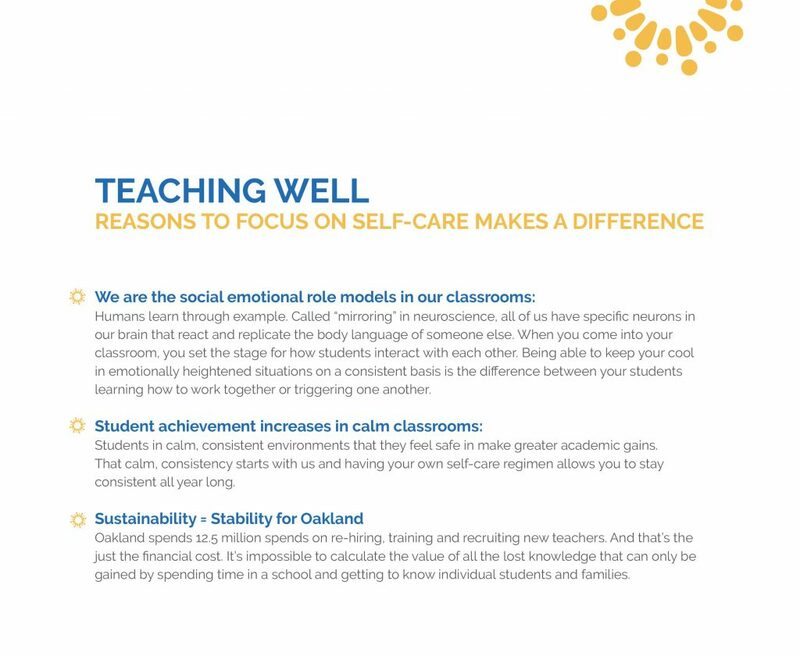 Through dozens of interviews and leading workshops for over 200 educators on the importance of self-care and resilience – I built The Teaching Well. Our goal is to provide school teams and educators with the tools and knowledge necessary to stay resilient and their best for kids in the classroom. 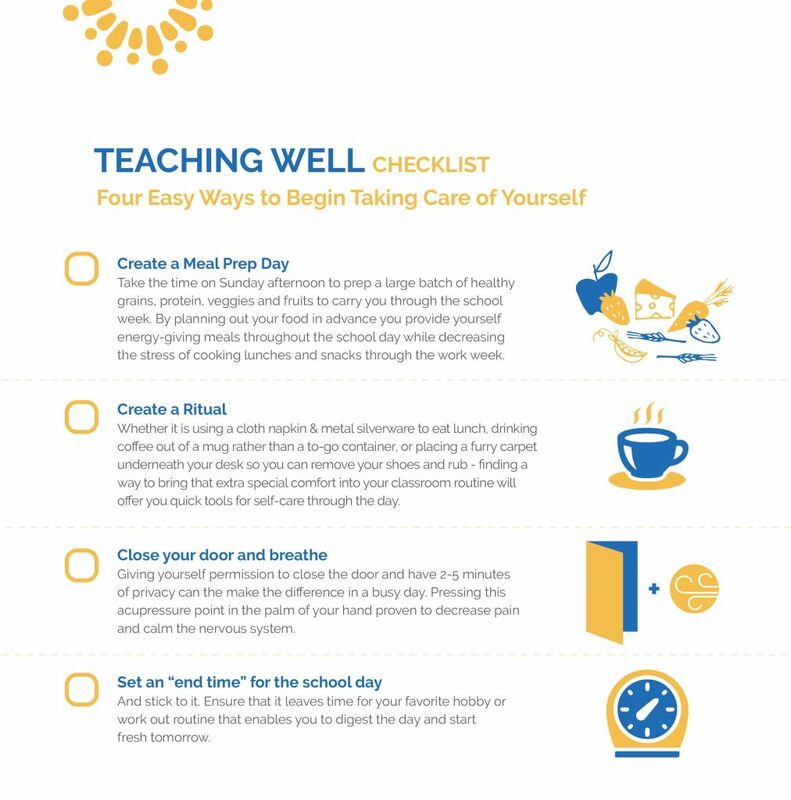 (Check out The Teaching Well for upcoming wellness workshops or to learn how your school can receive wellness support).